We have a new and improved camp format for our High School Players, the High School Players Small Group Training. 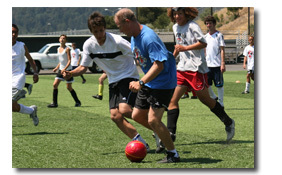 These camps are for current or incoming high school soccer players ages 14 to 17. Coaches will focus on preparing players for high school tryouts and the upcoming season. All campers will train in small groups of 3-6 players to create an intensive, motivating and fun practice environment. Coaches will focus on technical training, coordination and conditioning. The camp format dedicates the first part of the morning session to technical training and coordination and the second part to conditioning and matches. These camps are physically challenging and designed to push players to the next level. Coaches will monitor progress and provide all players with an evaluation report at the end of camp. Camp ends for all High School Players at 12:30pm. High School Players have the option to join the Advanced Players, ages 10-13, in the afternoon until 3pm. Please call us to add the afternoon. Extended care is offered from 3-6pm.